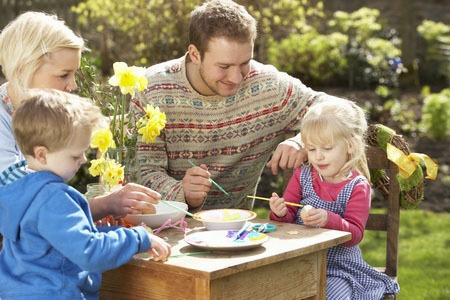 With Easter on its way, here are some fantastic ideas for holiday activities that won't break the bank. The clocks have changed and the days are finally getting longer. With that in mind, now is a great time to get outside and enjoy the fresh air. Days out don't have to cost the earth, and wherever you live there'll be a green space somewhere nearby to discover. Head to a park or nature reserve near you and make the most of the spring sunshine without spending any money. If you're in need of some inspiration, take a look at the National Trust's website. You don't need a big garden to be able to enjoy growing your own vegetables. Peppers, tomatoes and carrots can be grown in pots and containers, while salad leaves and herbs will do well on a windowsill indoors. There's nothing more satisfying than eating home-grown produce, and you'll be saving money too. We all love treating ourselves to a special meal, but eating out too often can be expensive. Food always tastes better outdoors, so why not head out for a picnic this Easter instead? You can pick up delicious home-made food at a farmer's market and enjoy a hassle-free meal away from home for a fraction of the price you'd pay in a restaurant. Put a high-tech twist on the traditional Easter egg hunt and try geocaching. All you need is a smartphone or GPS and a sense of adventure. You can download a free app for your phone and head out on a mystery trip anytime. It's a great way to explore new places, and finding hidden treasures is a fun activity for all ages. Either enjoy it completely free, or take along an inexpensive gift to trade for cached items. Spring is full of new beginnings, and it's the ideal time for a clear out. Decluttering is a great way to control your spending by getting rid of unwanted items and making the most of what you've got. You could also take the opportunity to tidy up your finances. Money Dashboard's free budgeting software will help you organise your accounts and keep track of your outgoings, with an automatic tagging feature showing you exactly how much you're saving when you clear out your home. Box up items you no longer use and turn them into extra money. There are car boot sales happening all over the country during the Easter period, so get your friends or family together and set up a stall of your own. You can even turn it into a competition to see who can bring home the most cash. With the new tax year starting, now is a great time to start thinking about how to save money. Make the most of your fresh ISA allowance and put aside some funds in tax-free savings. You can start an ISA with as little as £1, making a nest egg the perfect Easter gift. Easter eggs aren't expensive, but if you've got a lot of people to buy for, it can all add up. Make a list and shop early; budgeting for your purchases will help you choose wisely and make the most of the deals on offer. Try making your own Easter goodies. A simple gift of homemade biscuits is a pleasure to receive and your loved ones will appreciate the effort you have gone to.